With the iPhone 6 launch just around the corner, leaks have definitely sped up, and we’ve had plenty of evidence for that during the last couple of months. A number of alleged parts for the upcoming iPhone models have surfaced around the Web, most of them falling in line with earlier reports regarding the iPhone 6 and iPhone Air (if that’s what they end up being called). 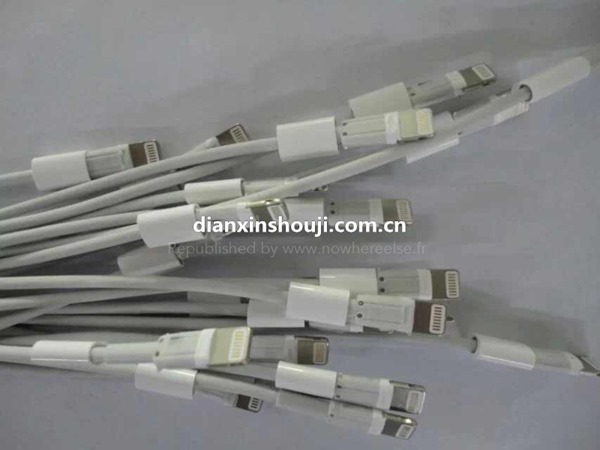 Today, however, we have another leak that supposedly shows the new iPhone’s Lightning cable, with the highlight being a reversible USB connector. 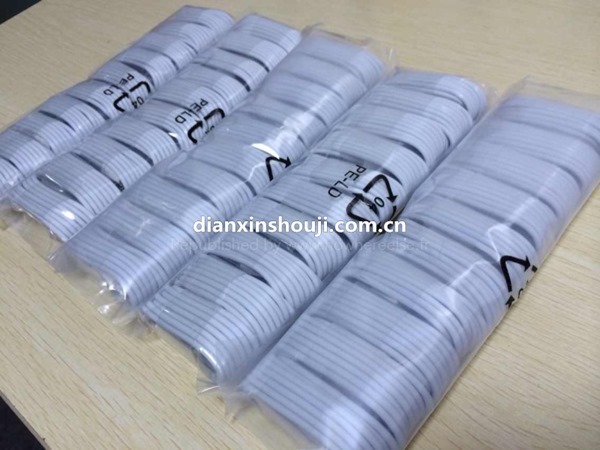 The leaked images, are supposedly from Apple’s supplier Foxconn, and show a USB plug which shows the connector attached to the center of the housing as opposed to an edge, which currently ships with not just iPhones, but all USB devices/cables worldwide. This will, in essence, enable the device to get attached either side up in the USB port of your computer, although we find it slightly difficult that this can be achieved whilst maintaining the size of the housing itself. Nevertheless, we’ll soon find out what Apple has done. Even though this leak, just like all others before it, is unconfirmed as of now, it’s quite likely to be true. 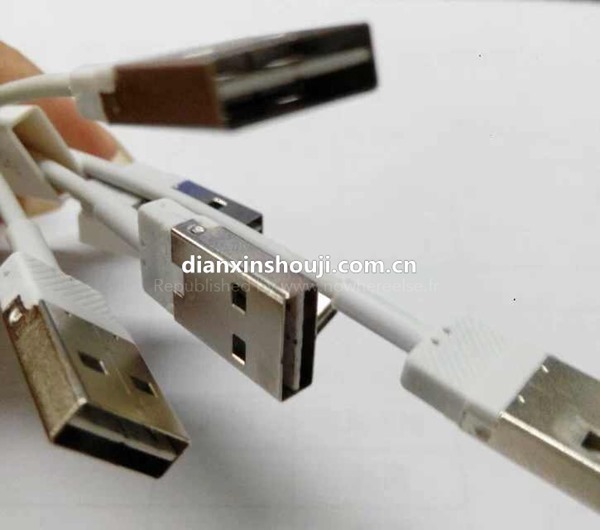 With the USB 3.0 Promoter Group propagating the use of Type-C USB 3.1 connectors worldwide, it is quite possible that Apple would jump early onto the bandwagon to gain the early adapter advantage. In case you haven’t read about it yet, USB 3.1 Type-C connectors are expected to be not only faster, but also reversible on both ends, meaning you can plug them into the USB port and the connected device either way and not get frustrated. 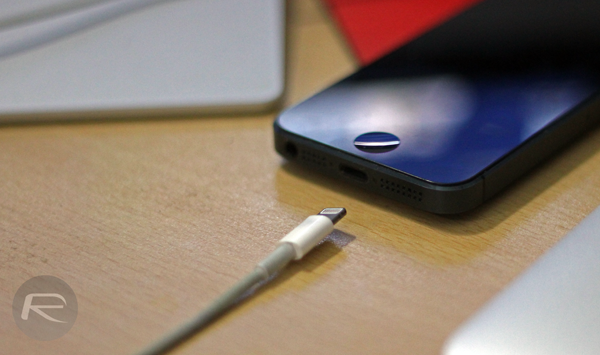 It’s noteworthy that Apple’s current generation of Lightning cables, which the company ships with its iPhone 5/5s and iPad Air, are already reversible, but only on the device end. Last month, Apple also filed a patent for a reversible USB connector, so putting two and two together, this leak might turn out to be legitimate. Even though it’s all speculation for now, Apple has had a track record of addressing minor annoyances that customers face with technology. Maybe this is a step in the same direction. Do you think these cables are legit? Share your thoughts with us below! Well being the “amazing” company that apple is they would be the company to have a reversible device connector and a reversible standard USB connector. They will eventually move to USB 3.1 type C while still having the lightning connector because they refuse to make life easier and cheaper. If it’s true, Apple should provide an adapter for all standard USB connector (which all computers have) since the new connector model not available anywhere yet. The question is: is the new USB connector compatible with old USB ports?